Is Neurodegenerative Disease a Kind of Cancer? 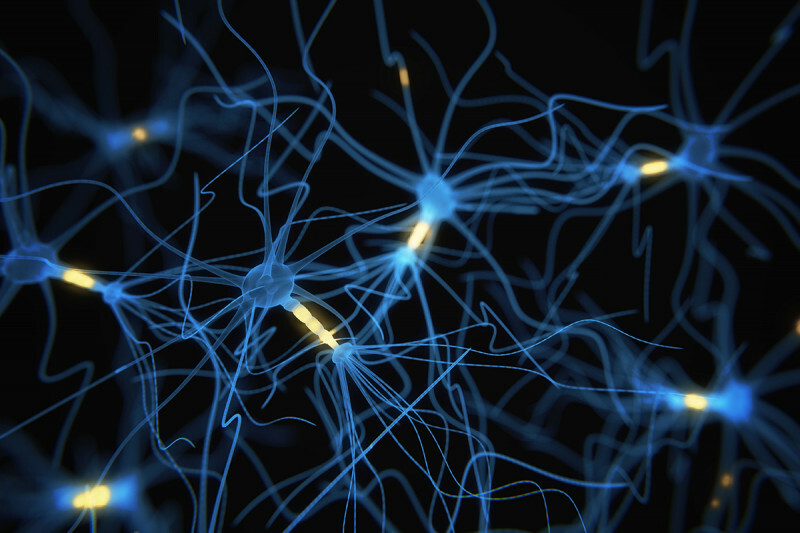 Neurons like those shown here are critical for movement, speech, thought, and other bodily processes. When neurons are damaged or die, the results can be disastrous. Neurodegenerative diseases such as Alzheimer’s and Parkinson’s are not well understood, and there are few effective treatments. A study from scientists at the Sloan Kettering Institute sheds light on the underlying causes of neurodegeneration and opens up new possibilities for treatment. For the thousands of people diagnosed each year with a neurodegenerative disease, a sobering fact compounds their suffering: Researchers do not know what causes these diseases, let alone what can be done to treat them in most cases. Neurodegenerative diseases — including Alzheimer’s, Parkinson’s, and multiple sclerosis — are marked by the progressive loss of brain cells called neurons. Depending on where in the nervous system these losses occur, a variety of cognitive and motor symptoms can ensue. For example, loss of muscle control is characteristic of multiple sclerosis. Cognitive declines and personality changes are associated with Alzheimer’s disease. Researchers have known for some time that a common feature of many neurodegenerative diseases is the heightened activity of helper cells in the brain called macrophages. Scientists have long assumed that these macrophages are hyperactive because they are responding to damage, maybe even trying to heal it. New research from investigators at the Sloan Kettering Institute contests the bystander role of macrophages. In a study reported in the journal Nature, they show that populations of macrophages harboring certain mutations in their DNA can lead directly to neurodegeneration in mice. Instead of reacting to damage, these cells may be causing it. The results challenge the conventional thinking and open up potential avenues for the diagnosis and treatment of neurodegenerative diseases. The SKI investigators didn’t start out looking to challenge the standard view of neurodegenerative diseases. Rather, they were interested in tracing the activities of a particular population of macrophage precursors called erythro-myeloid progenitors (EMPs). Until about five years ago, people didn’t even know that EMPs existed. These cells are derived from the yolk sac of an embryo. (The yolk sac provides the developing embryo with its first, temporary blood supply.) They colonize the developing organs of a fetus and differentiate into macrophages that live on into adulthood. These macrophages provide support to tissues. For example, they scavenge dead cells and other debris in a process called phagocytosis. What we show in this study is that certain somatic mutations that would cause cancer in other cell types instead cause neurodegeneration when they occur in microglia. They are also important during development, she says. That’s when they help sculpt tissue by pruning away some cells to allow others to come forward. But these sculptor-cleaners can also go into overdrive and remove things that shouldn’t be taken away. When valuable neurons are discarded, that causes trouble. Macrophages in the brain are called microglia. The study’s results help make sense of a curious occurrence in the field of cancer. Many people with a type of cancer called histiocytosis, which arises from mutated macrophages in tissues, eventually develop neurodegenerative symptoms many years later. This finding suggested to Drs. Geissmann and Mass that there might be a link between macrophages in the brain, mutations that cause cancer, and neurodegeneration. To test this hypothesis, they created genetically engineered mice with a mutated version of a gene called BRAF. This mutation is often found in macrophages from people with histiocytosis. (MSK physician-scientist Omar Abdel-Wahab, who treats people with histiocytosis, is a co-author on the paper and helped identify these mutations.) Investigators engineered these mice so the mutant gene was present only in the EMP cells that come from the yolk sac. When they looked in the brains of these mice after about six months, they found signs of neurodegeneration that looked similar to what you see in people with histiocytosis. The results reinforce a previous — and surprising — finding from the Geissmann lab. Many macrophages found in tissue come from the embryonic yolk sac, rather than from stem cells in the bone marrow (like other blood cells). The investigators further argue that these yolk-sac-derived macrophages could be the cell of origin in a subset of people with histiocytic diseases, including Erdheim-Chester and Langerhans-cell histiocytosis. An exciting possibility raised by this research is using drugs called BRAF inhibitors to treat neurodegenerative diseases. BRAF inhibitors are currently approved for the treatment of BRAF-mutated cancers. When the researchers fed the mice a BRAF inhibitor in their diet, neurodegeneration was prevented. Because the features of microglia in mice and in people with histiocytosis-linked neurodegeneration are similar, they are hopeful that the same thing may hold true in humans. Current versions of these drugs do not diffuse into the brain very well, so Dr. Geissmann suggests that improvements to these molecules would need to be made to improve their potential efficacy. This study received financial and other support from the National Cancer Institute, Cycle for Survival, the Marie-Josée and Henry R. Kravis Center for Molecular Oncology at MSK, the National Institutes of Health, the Artemis Association/Histio UK/A. G. Leventis Foundation, the Ludwig Institute for Cancer Research, EMBO, the Deutsche Krebshilfe e.V., the American Society of Hematology, the Histiocytosis Association, the Erdheim-Chester Disease Global Alliance, the Pershing Square Sohn Cancer Foundation, the Leukemia and Lymphoma Society, the BMBF-funded competence network of multiple sclerosis, the Sobek Foundation, the DFG Reinhart Koselleck, and the Ministry of Science, Research, and the Arts of Baden-Wuerttemberg (Sonderlinie “Neuroinflammation”). Is Lewys Body Dementia included in this research. In reply to Is Lewys Body Dementia… by Carole Schaffer, Ph.D. This study did not look specifically at Lewy body dementia. Many neurodegenerative conditions show heightened activity of microglial cells, but the most direct comparison in this case is people with histiocytosis-related neurodegeneration, since that is the population with known BRAF mutations in macrophages. Thank you for your comment. I believe this study is key and important. After going through a rigorous course of chemotherapy five years ago to treat BC, I noticed that 2-3 days following each treatment my capacity to think quickly, and recall detail, increased strongly. Mentally, I felt as if I were in my 30's again. My hyper-sharpness faded after approximately a week, until it was re-activated by another treatment. This was my experience, and mentally I'm pretty sharp, but I joked about it saying that maybe chemo-light could cure Alzheimer's? Everyone laughed. Are there any stem cell treatments on trial now in the NYC area for dementia? Dear Victoria, MSK is a cancer center. Dementia is not the focus of our research or clinical care. We recommend that you consult with other hospitals in the New York City-area to find out about the latest treatments for dementia. Thank you for your comment.